While Houston's museums might get a lot of attention, the downtown Theater District is the true lifeblood of the city's vast performing arts scene. Houston is one of only a handful of cities in the country with permanent professional companies in residence for each of the major performing arts disciplines — theater, ballet, opera, and music — and it boasts some of the best performance companies in the country. Founded more than a century ago, the Houston Symphony is one of the oldest performing arts organizations in Texas. The Houston Ballet is the fourth largest such company in the U.S., and the Houston Grand Opera is the only opera company in the world to win two Grammy awards, two Emmy awards, and a Tony. Houston has more than 500 organizations dedicated to visual and performing arts in some capacity — many of which perform in the Theater District. For those who love music, the Houston Symphony offers concerts or special musical events — such as movie showings with live orchestra accompaniment — nearly every weekend and often throughout the week. Broadway at the Hobby Center and the non-profit Theatre Under the Stars both provide a wide variety of musical theater shows, featuring beloved musicals like "The Lion King" and "Hamilton." The Houston Ballet and Houston Grand Opera offer performances on most weekends, and the Alley Theatre offers live stage performances of both contemporary and classic plays throughout the week — often with multiple performances a day. If you have kids in tow, be sure to check out the Houston Downtown Aquarium located just across Buffalo Bayou. In addition to myriad aquatic animal exhibits, the Aquarium is also home to white tigers, a shark tunnel and several games and amusement park rides. 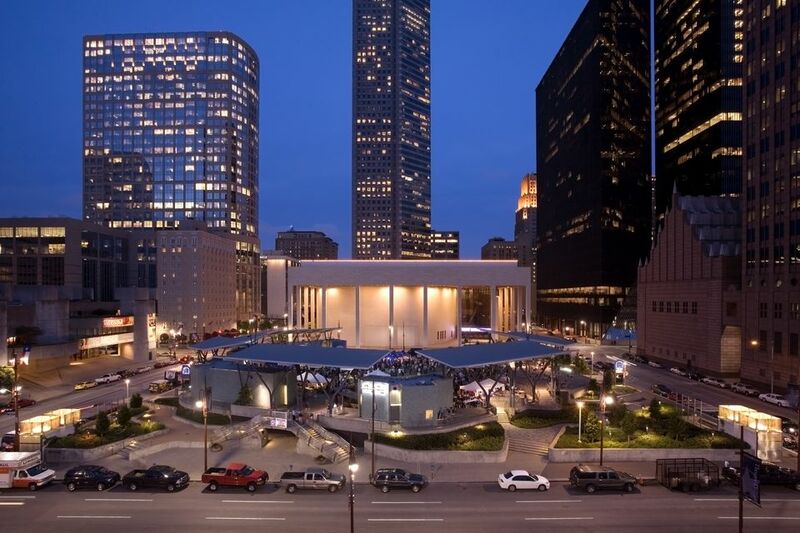 Houston's Theater District occupies a small section of the north side of downtown, where the city's major performance centers are all within easy walking distance from one another. Alley Theatre presents live theater plays throughout the year. Jones Hall for the Performing Arts is home to the Houston Symphony and often features speakers and performers coordinated by the Society for the Performing Arts. The Wortham Theater Center houses performances for both the Houston Grand Opera and the Houston Ballet. The Hobby Center for Performing Arts hosts touring shows from Broadway and London's East End, as well as from Theatre Under the Stars and other live performances and concerts. Street parking can be found on a limited basis throughout the District, but if you're driving, your best bet is to park in the Theater District parking garage at the corner of Smith Street and Capitol Street. Prices are typically $10-15, and you can pay with a credit card. The garage also offers pedestrian access to Jones Plaza. If you would prefer not to battle Houston's infamous traffic, the METRORail now has lines that extend down into the Theater District. The purple and green lines both stop right near Jones Plaza. For a good pre- or post-show dinner, most locals will point you to Perbacco. This classic Italian restaurant has high-quality food and elegant decor, making it great for date night. Located across the street from Jones Hall, the staff is accustomed to helping diners make it to their shows on time. It's a popular spot for pre-theater dining, so be sure to make a reservation beforehand — especially if you're planning on going on a weekend evening. If you aren't in a rush to make a curtain call, the Downtown Aquarium Restaurant is also a good bet. The dining room is surrounded by a 150,000-gallon aquarium filled with beautiful aquatic creatures that you can watch swim by your table, providing a fun atmosphere for families and dates alike. The Lancaster Hotel is a historic boutique hotel located right across the street from Jones Hall. In addition to attractive and comfortable accommodations, the hotel offers some great amenities, like a guest lounge with drinks and snacks and complimentary car service to anywhere within three miles of the hotel. From 5 p.m. to 6 p.m. every night, the hotel hosts a Wine Hour in the lobby, allowing guests to unwind before heading out to a show, and a full-service restaurant makes pre-theater dining a breeze. At around $125-$150/night, it's well worth the price. For a more contemporary luxury hotel, Hotel ICON is within easy walking distance from the Theater District. The hotel is surrounded by some of downtown Houston's best happy hour spots and is just off of the METRORail Red Line train.